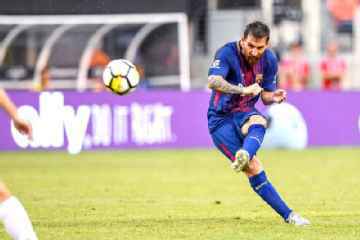 Barcelona vice-president Jordi Mestre has reassured fans that Lionel Messi will soon sign a contract extension. Argentina superstar Messi agreed terms on a new deal until 2021 last month, with the club saying it would be signed in the near future. Messi — who has been at Barcelona since the age of 13 — has yet to put pen to paper, however, with his current contract ending next summer. The new terms include an increase in the player’s release clause to €300 million. Speaking during the unveiling of new signing Paulinho, Mestre said: “It’s already discussed and agreed. Mestre had stated he was “200 percent sure” that Neymar would stay at Barcelona a week before the Brazil international joined Paris Saint-Germain in a world-record €222 million move.